With the help of our Community Partners we are able to reach out to several agencies in the area and to provide donations to help their efforts. We also provide aid to schools to support Science, Technology, Engineering, and Mathematics (STEM) programs, provide scholarships, support to Civil Air Patrol events and individuals to help build better citizens, recognize Teachers of the Year, and much, much more. By joining AFA as a Community Partner, you are supporting your local AFA chapter and all of its efforts to develop community understanding of, and support for, the US Air Force. 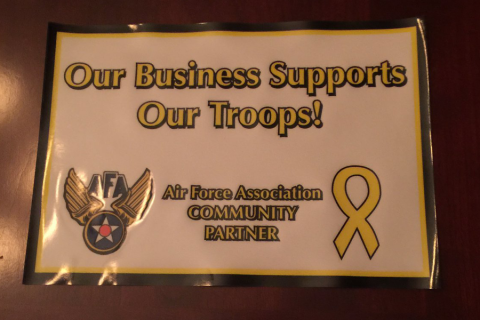 All Community Partners receive a plaque and an “Our Business Supports Our Troops” AFA window decal. By joining AFA as a Community Partner, you are directly supporting our efforts of your local chapter and providing support to AFA National efforts as well. The Community Partner program provides businesses visibility via our web page, mention and highlighting in our quarterly newsletters, as well as at special events. We have differing levels of support and would like to discuss this with you. Please call us at 903-274-9981 or email TX416.Northeast@afa.org for more information.